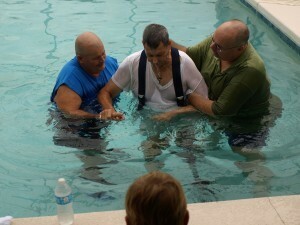 GraceConnect » Despite Tropical Storm, 10 Baptized at Fort Myers, Fla. Despite Tropical Storm, 10 Baptized at Fort Myers, Fla.
Rich Schneiders, pastor of Friendship Community Church, a Grace Brethren congregation in Fort Myers, Fla., reports that ten individuals were baptized yesterday (June 29) at the church. (Well, actually in the Schneider’s backyard pool, since the church doesn’t have a baptistry.) Here’s the story, told by Pastor Rich. At Friendship Community Church we had the privilege and joy to baptize 10 of our people who desired to be obedient to our Lord’s command to baptize in the Name of the Father and of the Son and of the Holy Spirit. 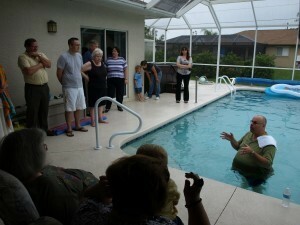 What makes these baptisms extra special is the fact that for some just getting into the pool was a real accomplishment. One of our men suffered a stroke a number of years ago and as a result lost his left leg above the knee. With his “water leg” on, he climbed down the steps into the pool. He said he did not realize how buoyant his prosthesis was. I had to stand on his prosthetic foot to hold him in place. One of our ladies suffered a stroke in 2009 and is just now beginning to walk again. Climbing down the 4 steps into the pool took considerable effort, and evoked some real fear, but she was committed to being obedient to her Lord, no matter how difficult. She was glowing when she made it out of the pool. Another women dealing with many financial and personal issues wanted to be obedient in baptism, which required her to get over her fear of putting her face in the water. Overcoming the fear she wept in obedience. We also had a young man that came to know the Lord just a few weeks ago after his fiancée and her family had prayed for him for more than two years. His future in-laws traveled from Pennsylvania to be at his baptism. Very moving! Perhaps the most interesting part of the day was the storm brewing over our area before the baptism. Tropical Storm Debbie had been dumping rain on our area for days. All through church we had downpours and wind. We had several call and ask if we were still going through with the outdoor baptism. During Sunday School we put the active radar up on the projector and I told the congregation that the Lord was going to provide us with a window of opportunity following the morning worship service. Sure enough, it was still raining when church was over and as people arrived at our house for the baptism. Since we don’t have a baptistery in our facility we utilize the pool at our home. Once everyone had arrived at the house and the baptismal candidates were ready to get into the pool the wind and rain stopped, the skies brightened and we were able to worship the Lord as one by one 10 people were baptized. When the last candidate exited the pool, the clouds darkened and it began to rain again. Another inch and half of rain fell the rest of the day. God was placing His stamp of approval on those that wanted to be obedient to Him in baptism and the ministry of Friendship Community Church. There were tears of joy and worship as we sang hymns of worship between each baptism. Our congregation has been blessed with seeing the Lord work in the hearts and lives of many of our people. This baptismal service was a reminder of what God is doing in and through us His involvement in our world. God is good! All I can say is AWESOME!!!!! AMEN!! !